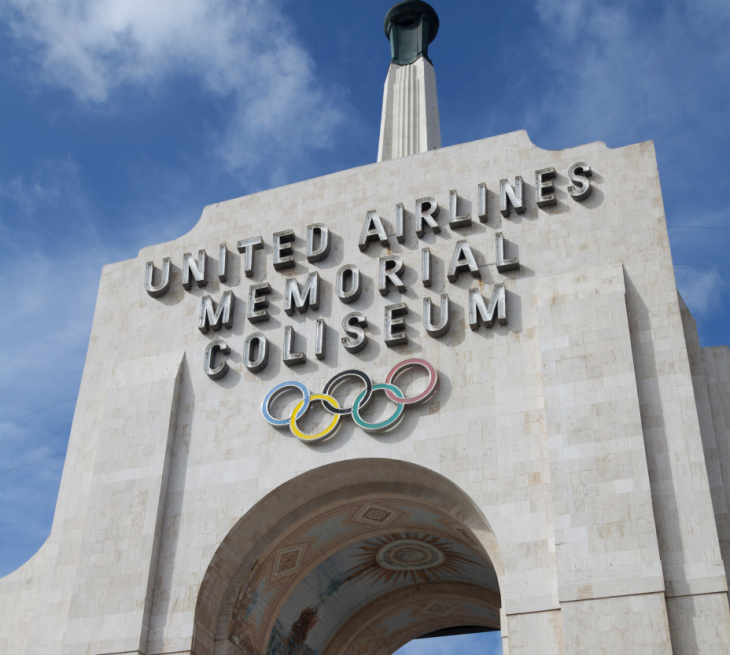 United Airlines has offered to pull out of a $69 million dollar deal to rename the Los Angeles Memorial Coliseum, a day after veterans and community members voiced their concerns at an oversight meeting. Many vets who attended the Thursday afternoon Coliseum Commission meeting said changing the name of the stadium, first opened as a World War I memorial, would be a betrayal of prior generations of military servicemembers. Several veterans said they hoped for a compromise, and floated the possibility of naming just the field after United, instead of the entire stadium. In a statement on Friday, USC said it was open to modifying the naming deal to "United Airlines Field At Los Angeles Memorial Coliseum" — if United agrees. But the airline's California president Janet Lamkin seemed to pour cold water on that idea in a letter to USC on Friday. Lamkin sent the letter to USC Vice President, Emeritus Todd Dickey, saying the airline sees the new name as a "key provision" of the agreement. It was announced in January 2018, to help pay for a $300-million Coliseum renovation. United will step away from the agreement if USC is not able to honor that deal, she said. Lamkin said the company worked carefully with USC and the Commission to keep "Memorial" in the name to honor veterans. L.A. County Supervisor Janice Hahn, who leads the Coliseum Commission, provided this response to the United Airlines letter: "I am disappointed that United is unwilling to pursue a compromise and I think veterans across the country will be disappointed as well." The dispute is headed for mediation beginning April 8th. March 28 — The Los Angeles Memorial Coliseum has a rich history. It's the only venue in the world to have hosted two Olympics, two Super Bowls, and one World Series. The stadium, opened in 1923, continues to be home to USC football. Right now, it's also hosting the Rams until a new stadium (that will also host the Chargers) is ready in Inglewood. 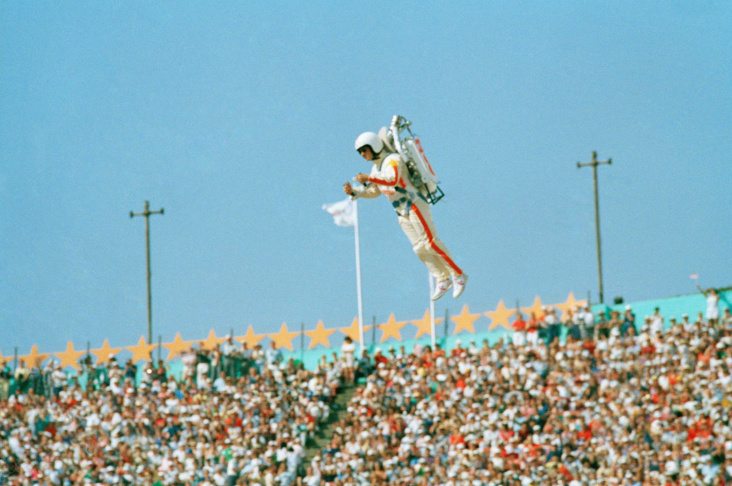 When the Olympics return to L.A. in 2028, the Coliseum will be a key venue again. But what name will be on the stadium to greet the crowds? There is a battle brewing over that now — and a meeting of the Coliseum Commission Thursday got contentious. "Vietnam Veterans of America have the motto, 'Never again will one generation of veterans abandon another," said Jerry Orlemann, who served in Vietnam. "In my opinion, any veteran at this point who does not oppose, and stand up and speak against this renaming is abandoning the generation of veterans who fought and served in World War I." The dispute now moves to mediation, beginning April 8. A retired judge will oversee the process, which will be closed to the public. BACK UP. WHAT'S GOING ON WITH USC AND THE COLISEUM? For years, the stadium was in need of a major facelift. Designed for sports fans of the 1920s, the seats were small, rows narrow, and no armrest cupholders were in sight. Of course, the stadium hadn't gone untouched since its opening — there had been updates over the years, some major. But after nearly a century of wear and tear, the stadium was showing its age. And USC has been spending a ton of money to renovate it under the terms of a 98-year lease signed in 2013. It's over halfway done with the major work — including a new tower on the South side of the Coliseum with kitchens, concessions, fancy suites, lounges and press boxes. USC says it's spending more than $300 million on upgrades. Back in January 2018, school officials announced a deal to help pay for all that construction: USC sold the naming rights for the L.A. Memorial Coliseum to United Airlines for $69 million dollars. Under the deal, the venue will be called the "United Airlines Memorial Coliseum" for the next 16 years. But local veterans groups are now saying, "not so fast." They argue this is a memorial dedicated to World War I service members, and it shouldn't have a corporate sponsor. DIDN'T TAXPAYERS BUILD IT? HOW CAN USC CHANGE THE NAME? Yes, it's a public building. The state, county and city of L.A. jointly own the Coliseum. The facility is overseen by the Coliseum Commission, whose members include City Councilmember Curren Price, State Senator Holly Mitchell, and the Commission President, L.A. County Supervisor Janice Hahn. Under those lease terms, however, USC now controls the building. That agreement also included Exposition Park and Sports Arena. Critics say the terms were negotiated largely out of public view and at a time when the management of the Coliseum was under a lot of pressure. The facilities had not been updated for years. Several former managers of the Coliseum were indicted for taking bribes from rave promoters. There were irregularities in the financial bookkeeping. A 15-year-old girl died from a drug overdose after a 2010 event she was too young to attend. SOUNDS LIKE THINGS GOT PRETTY BAD. It wasn't good. So the deal was done. USC would manage the Coliseum and pour millions of dollars into renovating the stadium. Under the lease, USC keeps all revenue from tickets and concessions at games. The school pays the state over $1.3 million in rent, as well as 5-percent of the naming rights proceeds and about 5-percent of any overall operations profits. That amount escalates as profits go up. SELLING NAMING RIGHTS TO BIG VENUES IS PRETTY COMMON. WHY IS THIS DIFFERENT? The Coliseum has a unique amount of history behind it. Courtland Jindra, member of the California World War I Centennial Task Force, says it's one of the most important living memorials to World War I in the U.S..
"After the war, cities across the country were trying to find a way to memorialize the dead," Jindra said. "It was a scale of loss that we can't really comprehend today." Many early events were military-themed: for the 1923 "Armistice Day" celebration (what later became Veterans Day), the L.A. Times estimated 100,000 people visited the stadium and Exposition Park for a parade paying tribute to soldiers who served in The Great War. During World War II, military leaders would come to speak at the Coliseum, and there were mock-battles during halftime at football games. It even hosted a 2-day "Army Ordinance in Action Show," including military training and drills. In 1945, the stadium was decked in bunting and filled with cheering Angelenos welcoming General George S. Patton and Lt. Gen Jimmy Doolittle home after V-E day. Sporting events were always part of Coliseum history. Trojan football played there since the beginning: an October, 1923 game against Pomona College. The Coliseum also played a role in the integration of the NFL. Black players had to be allowed into the league to play at the Coliseum because the stadium was built with public funds. That led to the signing of African American tailback Kenny Washington in 1946. The list of California teams that have taken the field — or court, or ice — at the Coliseum is impressive: The Rams, Dodgers, Lakers, Raiders, Chargers, Clippers, Kings and UCLA Basketball all called it home at one point or another. 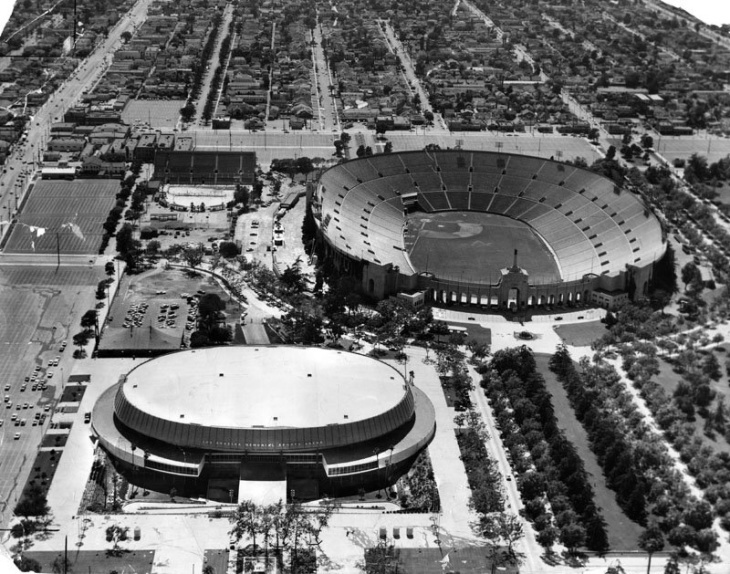 The 1932 and 1984 Olympic Games had the eyes of the world on the L.A. Memorial Coliseum. But politicians also spoke there — as candidates or while in office — including presidents Hoover, Roosevelt, Kennedy, Nixon and Reagan. Martin Luther King, Jr. and Cesar Chavez paid visits, along with religious leaders: the Pope and Bill Graham both drew gigantic crowds. It was declared a federal Historic Landmark in 1984. WHAT DO L.A. VETERANS SAY? "For [USC] to rename it is anathema. It's totally inappropriate. It's not theirs to rename. I don't care what the leasing rights may say. They are leasing it." "I totally was shocked. And now I'm just thinking about all the color guards that I've presented there. I'm a hometown girl — I grew up in the community. I would have just hoped [USC] would really consider the historic background." "They did it without talking to the veterans in the community. This is a memorial to World War I veterans. 116,000 veterans died in that war." "This stadium was a wreck before USC took it over. 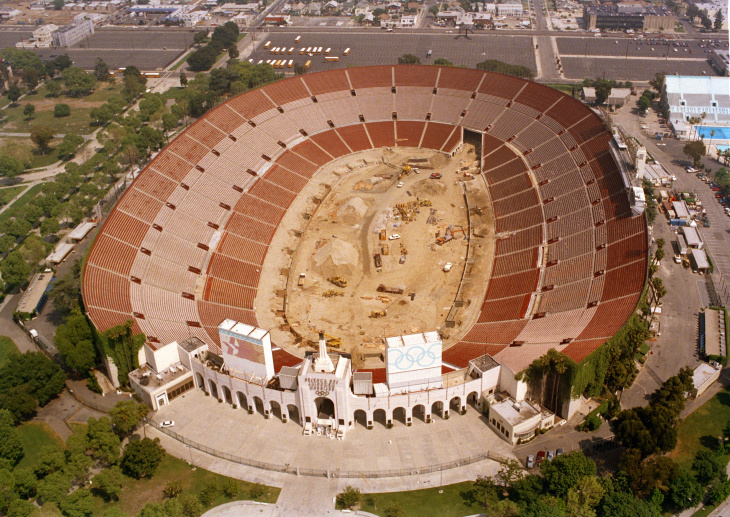 We didn't do anything when this stadium was falling apart and it was the L.A. Memorial Coliseum. USC is making this stadium worthy of the veterans who fought and died." At Thursday's meetings, there were voices both for and against the renaming proposal. "I love Chik-fil-a but I don't want their name on it 10 years from now. I fly United Airlines but I don't want their name on it. This is a historical landmark." "To be very blunt, please don't sell out to the corporate interests to change the name of the Los Angeles Memorial Coliseum...USC is not hurting for money." "It's just a name change... this has provided so many opportunities for Angelenos." USC ANNOUNCED THE NAME DEAL MORE THAN A YEAR AGO. WHAT'S THE SCHOOL SAYING NOW? USC says it's well within their rights to rename the Coliseum, and sprucing things up will continue to honor its military legacy. "In 2012 the Coliseum Commission agreed, 8 to 1, along with the State, to extend to USC a master lease to operate the Coliseum through 2111. "The contract called for USC to improve the Coliseum, including finding a facility naming sponsorship, as long as the words "Memorial Coliseum" remained in the stadium's new name. "USC's stewardship has been exceptional. The naming rights agreement provides an investment to make sure the historic venue is preserved for future generations and continues to honor veterans." The school negotiated with the Coliseum Commission to keep the "Memorial" part of the name to continue honoring veterans, according to Todd Dickey, USC President Emeritus. "We did everything that they asked for. We went out, we sold the name," Dickey said. "Now we have actually built the stadium and spent the money, and the commission is changing the rules that they imposed on us that we followed exactly." HAS OPPOSITION TO RE-NAMING STADIUMS WORKED ANYWHERE? There has been talk about selling the naming rights to Soldier Field in Chicago, which was also dedicated to the men and women of the Armed Forces back in the 1920s. Former Mayor Richard M. Daley floated the idea in the early 2000s to help pay for renovations, but veterans groups successfully fought the city of Chicago on that. The Chiefs' Arrowhead Stadium has been looking for a partner to sell naming rights for the playing field, but keeping the stadium name the same. The Coliseum Commission sent a letter to USC in November asking for mediation to work out the dispute over the name change issue. The Commission argues this change needed their approval, especially because it includes alterations to the exterior of the Coliseum. Supervisor Hahn is collecting signatures for a petition to keep the name unchanged. She published an op-ed in the L.A. Times on Monday. Many veterans and community members who attended the commission meeting Thursday afternoon said they want USC to change its mind and modify the deal with United Airlines to keep the name free from commercial branding, and focused on its history as a war memorial. WHAT ABOUT JUST SELLING THE NAMING RIGHTS TO THE FIELD? Right. Something like: "United Airlines Field at L.A. Memorial Coliseum"? Veteran advocates we spoke to are in favor of that type of compromise. But the deal with United was announced in January 2018. It appears signed, sealed, and delivered. The new moniker is due to go up on the Coliseum in August, including on the iconic Coliseum 'peristyle'— the colonnade where the Olympic rings are displayed. USC says changing the arrangement would significantly lower the value of the naming rights. "We've had many conversations about this," Dickey said. "If...[public money] could make up the difference, a compromise could be possible in this matter." Of note: the deal was made under a previous university president, Max Nikias. Now this issue is in incoming president Carol Folt's court. March 29, 2:19 p.m. This article updated with USC's response. 1:30 p.m.: This article updated with information about United Airlines saying they would be willing to back out of deal, if the the community opposes renaming stadium. March 28, 5:50 p.m.: This article was updated with comments from the meeting and information about next steps. This article was originally published at March 28 at 7 a.m.